Retired Capt. Robert Schornstheimer was in the cockpit of Aloha Flight 243 in 1988 when the plane's fuselage blew off in midflight. Schornstheimer, who now faces the plight of a major reduction in pension benefits, was pictured last year after completing his last flight before he retired. Eighteen years ago, Capt. 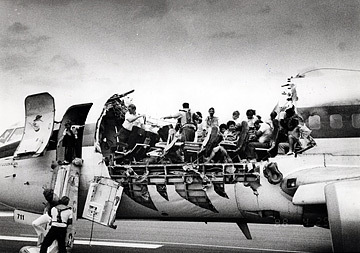 Robert Schornstheimer was in the cockpit of Aloha Flight 243 with 95 people on board when a large section of the plane's roof blew off at 24,000 feet and the cabin rapidly lost pressure. First Officer Madeline Tompkins was flying the plane from Hilo to Honolulu when the pandemonium hit, and Schornstheimer quickly took the controls and diverted the flight to Maui for an emergency landing on one engine. One flight attendant, C.B. Lansing, was sucked through the roof but the other people on board landed safely. Schornstheimer and Tompkins were hailed as heroes. Now, Schornstheimer, 61, is facing a different kind of emergency. Retired since last August, he is troubled by the prospect of watching the pension benefits he accrued during his 28 years at Aloha Airlines get reduced by more than half. Aloha, which terminated the pension plan of its pilots and other unions in December as part of its bankruptcy reorganization, handed over the responsibility for those plans to the Pension Benefit Guaranty Corp., the federal agency that insures benefit payments to U.S. workers. But by relinquishing responsibility for those payments -- a move that Aloha said was necessary to emerge from bankruptcy -- the carrier left its pilots and other union members with the prospect of receiving much lower payments in retirement than they had planned on. The reductions could range from 30 percent to 90 percent, depending on when the pilots became vested in the plan and when they retired. "The bottom line is these pilots are taking a financial hit," said PBGC spokesman Jeffrey Speicher. "It's unfortunate anybody is losing a dime. But the PBGC administers the plan under the rules and will pay as much as we can. We have the limits set by Congress in the insurance contract and we fulfill it." For Schornstheimer and others, the issue is an emotional one. "I'm shaken," Schornstheimer said Wednesday night while attending a pension agency orientation meeting with about 90 other pilots at Honolulu Airport. "It's bothering me not only for myself, but for a lot of my friends. People who retired in the last three years are the ones taking the biggest hit because they roll the back the clock three years from December 2005 to December 2002 (when determining longevity and the amount of benefits)." Schornstheimer said he stands to lose about 52 percent of his benefits. "It's an emotional thing for all of us to see our life's work -- more than half of it -- get taken away," he said. "I'm losing over half and I have friends who are losing even more." This is the Boeing 737 that lost the forward upper half of its fuselage in-flight. Capt. Robert Schornstheimer and First Officer Madeline Tompkins were able to maintain control of the aircraft and land it on Maui. Still, there is some hope for the pilots. That is because during Aloha's bankruptcy, the Aloha unit of the Air Line Pilots Association negotiated a provision with Aloha that if Congress passed a bill allowing companies more time to satisfy pension liabilities, Aloha and the union would jointly petition the federal pension agency to restore the pilots' pension plan to Aloha, in a frozen state. 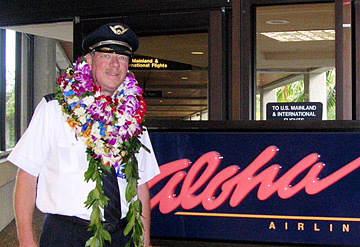 That means Aloha's pilots would lose only about five months' worth of accumulated pension. Yesterday, President Bush signed a pension bill that triggers the Aloha provision, granting airlines who have frozen their pension plans an additional 10 years -- or 17 years overall -- to pay off current underfunding. Aloha's pilots plan, which has $141 million in liabilities, has assets of $69 million and is underfunded by about 51 percent. But returning administration of the Aloha pilots' pension plan to the company may be a long shot. For one, the PBGC has returned a pension plan to a company that terminated it only once in the agency's 32-year history. That was LTV Steel Corp. in 1992, and it was only after it was decided by the U.S. Supreme Court. Secondly, the onus is on the company, in this case Aloha, to request that the pension plan be returned. At that point, the federal pension agency has to review the request and decide whether to give back the plan. Capt. Paul Phillips, 43, the chairman of Aloha's retirement committee, said the pilots union already has started looking into what it would take to get the plan restored. But, Phillips added, he has yet to hear from the company. "They say they're behind us, but other than that, we have not heard them say they will go with the pilots to Washington, D.C., to petition." Phillips said. "Right now, it's the pilots who are pushing that issue, and we want to put the company's feet to the fire. They agreed to it back in November. They said they're all for it. Now it's time to fish or cut bait." Aloha spokesman Stu Glauberman said all the airline will say is "we're working closely with the pilots on this issue." Speicher said there are about 440 participants in the Aloha pilots' pension plan. They include active and retired pilots, beneficiaries and pilots who are no longer working for the company but can draw benefits when they become eligible. Of the 132 retirees and beneficiaries, 82 will see reductions in their benefits. Forty of those 82 will see a cutback of between $1,000 and $2,000 a month and 19 of them will absorb a reduction of more than $2,000 a month. Speicher said 151 of the 267 active Aloha pilots will see benefit reductions when they're eligible to retire. For Phillips, it's a hard pill to swallow. "For me, what I'm scheduled to get upon my mandatory retirement is 65 percent less than what I was promised," he said. "As it stands now, when I retire in 17 years, I will get $2,471. That's less than somebody who retired in 1977 in their retirement. So in a 46-year span, I will make less than that retiree."